Above: Slender blocks of acrylic, called “blanks,” await their turn at the lathe, to be crafted into comfortable and appealing shapes as pens. Ribbons of color within some blocks yield fascinating patterns; others gain beauty from a thin veneer that may mimic the pattern of leaves or a corporate logo, protected under a clear finish. Ex-wives don’t often get a lot of credit. But it was an ex-wife who set Rob Beers on a course that changed his life and his career. 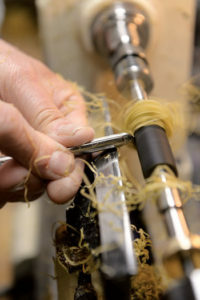 While they were married, Beers explains, “she bought me a small lathe,” the type of wood-turning contraption used to make spindles, chair legs, candlesticks—anything crafted from a length of wood that is rounded and symmetrically shaped with carving tools as the wood spins at a frenzied pace. His more recent career in a corporate environment didn’t satisfy that desire, and it had about run its course anyway. Beers devoted himself to crafting pens on his lathe, turning slim blocks of exotic woods and decorative acrylics into sleek pen barrels. Slim ones, fat ones, subtle or flashy—all carefully shaped as the air fills with fine dust flung from the lathe. “I’d go into my basement shop at 5 in the morning and lose all track of time for the next 18 hours,” he recalls. 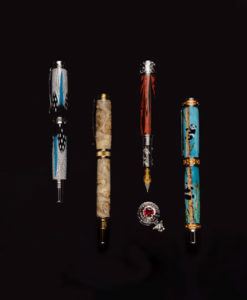 Clips, caps, bejeweled finials and other decorative elements are selected to complement the style of each pen. Initially, Beers hawked his pens at craft fairs and art shows. “I’m not an artist,” he insists. “I’m a mechanic.” Yet there’s no denying the artistry of his work. 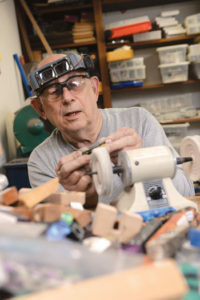 Stooped over his lathe, awash in bright light and shavings, Beers peers from behind safety glasses and jeweler’s loupes. Strong fingers hold the cutting tool at a precise angle with practiced force. He can say what he wants to the contrary; to the onlooker, this is art. He added retailer to his résumé in 2006 when he opened a kiosk at Valley West Mall, where he later graduated to a full-scale store, Quill & Nib, since relocated to Valley Junction. The store features Beers’ own pens plus commercial lines with prices ranging from a few bucks to several thousand—fountain pens, roller balls, ballpoints, any way to get ink on paper. But his own creations outsell the manufactured models by 10 to 1, he says. “I sell more fountain pens than anything else,” Beers says, and he recommends them. A fountain pen has an inherent elegance and a graceful control of the flow of ink, he explains: “You tend to write more slowly, carefully—and that results in better penmanship.” More importantly, he says, writing slowly seems to relax the brain and fosters more thoughtful communication. Most newcomers enter the store out of curiosity, rather than because they need a pen (or the stationery or other accoutrement he purveys). In fact, there’s more conversation than handwriting in a pen shop. A business lesson Beers learned early: “You don’t sell a product, you sell a story.” And those stories get passed around. A micro with a big following—and an unpredictable one. Men, women, young and old—“seems like the only thing they have in common is a love of pens,” he says, which keeps life interesting at Quill & Nib. There, Beers says, he enjoys surprises, like “a scruffy looking dude who came in one day and spent about $2,000. Rob’s shop is a delight and an amazing resource for Iowans. If you like writing, pens, pencils, paper, ink, etc, then you owe it to yourself to visit. Rob has helped me many times. Our local pen club, IowaPen, has met there several times and we’re going to get him to give us a demo of making pens one day soon; he’s installed a pen-making shop in the store now (not just in his home basement). Nature photographer focuses on careful planning, then waiting.